Henshaw, Frederic, head-of-household, age 32, born in Arizona; father born in California [sic]; mother born in California; owned home; occupation: S[..unclear..], water dept. Henshaw, Caroline, wife, age 33, born in Massachusetts; father born in Massachusetts; mother born in U.S..
Henshaw, Frederic C. Jr., son, age 1 year 9 months, born in Arizona; father born in Arizona; mother born in Massachusetts. Henshaw, Fred C., head-of-household, age 42, born in Arizona; father born in Missouri; mother born in California; first married at age 23; owned home ($2500 value); no radio in home; occupation: Secretary, Water User's Assn. ; not a veteran. Henshaw, Caroline R., wife, age 43, born in Massachusetts; father born in Massachusetts; mother born at sea; first married at age 25. Henshaw, Frederic C. Jr., son, age 12, born in Arizona; father born in Arizona; mother born in Massachusetts; attended school. Henshaw, Albert W., son, age 9, born in Arizona; father born in Arizona; mother born in Massachusetts; attended school. Frederic C. Henshaw, 81, an executive 37 years with the Salt River Valley Water Users Association; died Sunday in his home, 1236 E. Myrtle. Mr. Henshaw's father, A.L. Henshaw, settled in Phoenix in 1883 and planted one of the first commercial orchards where some of the fruit was dried and freighted to Arizona mining towns. Old Henshaw Road was named for his father. Mr. Henshaw started as a timekeeper with the Bureau of Reclamation in 1910 and was shortly afterwards transferred to the water services and made chief clerk. He was then assigned to special work in preparing water right contracts covering all lands of the project. When the association took over the operation in 1919 he was appointed its secretary, a position he held for 27 years. He also served as personnel director. After retiring in 1947, Mr. Henshaw devoted his time to a citrus grove which he first planted in 1929, and for several years he served on the board of directors of the Arizona Citrus Growers Association. His other activities included membership in the Arizona Pioneers Association. Services will be at 11:30 a.m. tomorrow in A.L. Moore and Sons Mortuary, 333 W. Adams. Friends may call from 3 to 10 p.m. tomorrow in the mortuary. Burial will be in Greenwood Cemetery. Survivors include his wife, Inalene, two sons, F.C. Henshaw Jr. of Phoenix, Albert W. of Bakersfield, Calif; five grandchildren and three greatgrandchildren". 1930 census, Phoenix, Maricopa County, Arizona; roll T626-58, ED 33, page 2B, line #76, dwelling #47, family #48. 1910 census, 4th Precinct, Phoenix, Maricopa County, Arizona; roll T624-40, ED 74, page 32A, line #29, dwelling #81, family #82. 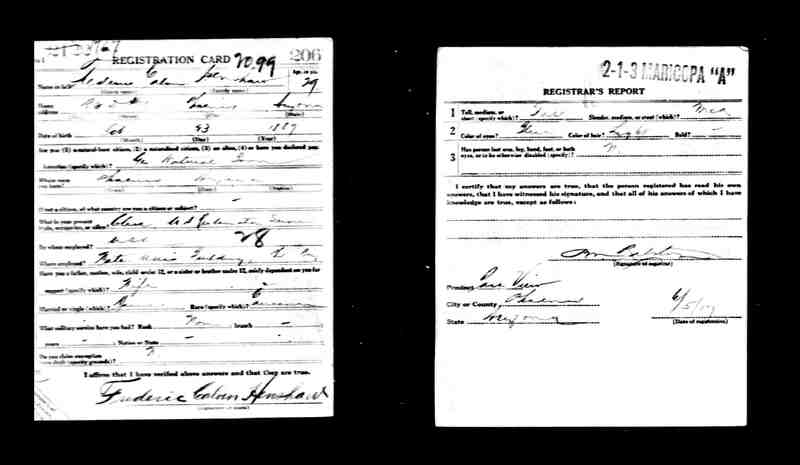 1920 census, Phoenix, Maricopa County, Arizona; roll T625-49, ED 65, page 14A, line #18, dwelling #332, family #341. Contribution from David Smith ().